Small Batch Sour Cream Banana Muffin have such nice crown! 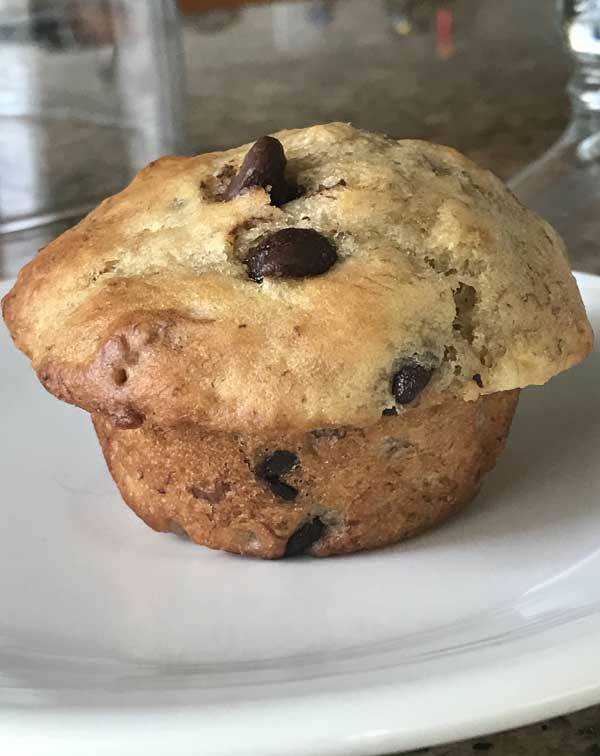 The high rising muffins, adapted from The Prepared Pantry, have an ingredient list that is a little different than most. There is a high proportion of bananas, not much sugar in comparison to flour, and the recipe calls for egg yolks instead of whole eggs. I was interested in seeing what the texture would be like, and am very pleased with the results. These were light, textured muffins with just the right sweetness. The topping helped in that department, so I wouldn’t leave it off. Update: I leave it off all the time now and just add walnuts or chocolate chips. If you have plenty of bananas and there are people who like banana bread in the house, I highly recommend that you use the original recipe from The Perfect Pantry. However, if you’d like to scale it down, here’s the recipe as I made it. Small Batch Sour Cream Banana Muffins makes 4 muffins. Preheat oven to 400 degrees F. and grease five muffins cups. Mix together the mashed banana, sugar, vegetable oil and egg yolk. Stir in the sour cream and vanilla. Mix together the flour, baking powder, baking soda and salt. By hand, stir flour mixture into banana mixture. Scoop up batter and divide evenly among greased cups. Make topping. Mix together brown sugar, flour, salt, and cinnamon. Stir in nuts. Add melted butter and stir until you have moist crumbs. 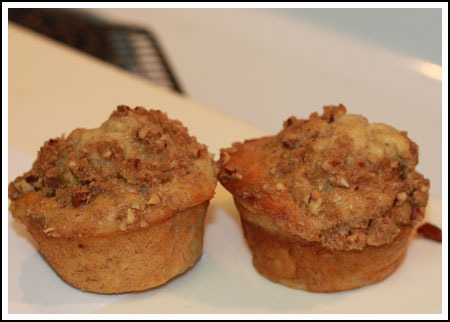 Sprinkle tops of muffins with crumbs (you will have leftovers). Bake on center rack at 400 degrees for 8 minutes. Reduce oven heat to 350 degrees F and bake for another 15 minutes or until a cake tester or toothpick inserted in the muffins comes out clean. My muffins didn’t really seem done, but the toothpick came out free of crumbs so I knew they were. You don't have to do this, but I've found that if I make the batter and let it stand for about 20 minutes before scooping, the muffins rise a little higher and have nicer crowns. I said what I meant and meant what I said, I made the muffins yesterday. 40 minis. They are great, high domes, light and perfectly bananay. I added 1/3 cup mini chocolate chips to the batter and a few tablespoons to the streusel topping. (My kids will only eat them if there is chocolate chips, they even overlook the walnuts when there are chips. If I just did walnuts, they wouldn’t touch them. Well we’re sold on the sour cream and banana title…but the nut topping also sounds just delicious. And love the thought that they’re a bit lighter too…always have too many bananas around and love any excuse to bake them into something delish! with a lot of bananas to do the base, i think i will enjoy them a lot ! Cause i am, and it will be fun to follow our products ! Anyway, i am “abonnée “to your wonderful Cookie Madness, and i put it on FB often to show it to my friends ! You’re so creative to scale down the recipe. That’s something I never think to try. 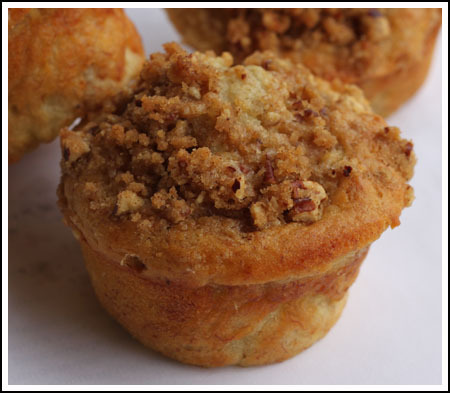 The muffins look craveable, especially with the streusel topping! Making these today. I have 5-6 ripe bananas. I think I’ll make minis and freeze them for reunion-family next week. The Prepared Pantry also has lots of fun kitchen items and baking ingredients. I’ve bought from them before. These look fab – I like the streusel topping. Sour cream always gives such a nice texture to baked goods. I can’t wait to see what kind of pie you make! I never thought of sour cream banana muffins. They sound great! Your first photo looks great! I’m sure I’d like these muffins. I like the idea that a lot of the sweetness comes from the banana. Katherine, you can always play around and try it, but what I liked about these muffins was their light texture. I think whole wheat flour would weigh them down. Do you think I can use all whole wheat flour instead?